This article was originally written by Joe Crea and published on Cleveland.com on January 29, 2016. 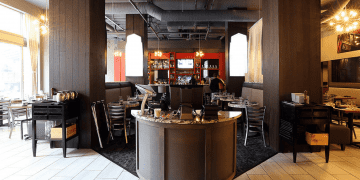 CLEVELAND, Ohio — The Kimpton Schofield Hotel, opening in March at the corner of East Ninth Street and Euclid Avenue in downtown Cleveland, will be home to a new restaurant from the owners of Parker’s Grille & Tavern in Avon Lake. Parker’s Downtown, a 120-seat restaurant occupying two stories and 4,700 square feet in the historic Schofield Building, will feature a lounge and bar just off the hotel lobby, a main dining area and a pair of private dining rooms. The new restaurant is tentatively due to open by mid-April. The Kimpton Schofield, built during the early 1900s, is named for Cleveland architect and Soldiers and Sailors Monument designer Levi Scofield. According to the Cleveland Landmarks Commission, at some point the architect dropped the “h” in his name. Co-operator James Mowbray, who just signed a lease on the space with his wife and business partner, Victoria Mowbray, says that the area’s design will reflects Cleveland’s industrial heritage. StudioCRM, architects for The Kimpton Schofield Hotel and Residences, are designing the new restaurant. 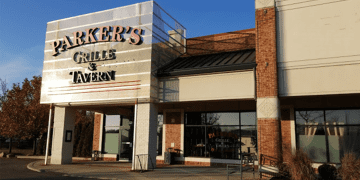 Parker’s Downtown will be the second location for the Mowbrays, whose Parker’s brand is named for their young son. The couple’s credentials are in polished service dining. Before opening their casual-upscale suburban restaurant, at 32858 Walker Road in 2013, James Mowbray was longtime manager for Morton’s The Steakhouse in Tower City Center. Victoria Mowbray is a Culinary Institute of America graduate. “Honestly, I miss downtown,” James Mowbray says, laughing about a return to the fray of operating in an urban setting. He pauses to consider the new location – on the southwest corner of a major intersection, adjacent to Heinen’s downtown supermarket in the historic Cleveland Trust Bank Rotunda and the tony Metropolitan at the 9hotel and apartments. A wall of windows will open the front wall of Parker’s Downtown to a view of the cityscape. “With all the great things happening in the city, we want to be part of it – and we have the opportunity to move downtown with a fantastic partner, The Kimpton group,” James Mowbray says. “There was no way we were going to turn down that,” he adds. In addition to the restaurant, lounge and private dining facilities, a central kitchen in the hotel’s basement will produce room service and food and beverages for special events held on the property. Despite their steakhouse past, the Mowbrays’ next venture will be far less beef-centric. Food at the new restaurant will lean on “modern American” flavors, James Mowbray says. Steaks, chops and other familiar fare from the grill will appear on the menu. 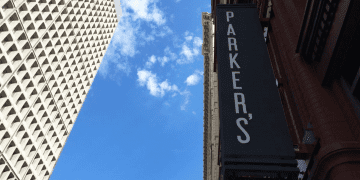 “But we don’t want Parker’s Downtown to be branded as a steakhouse. Instead, he says, some dishes will be drawn from the Avon Lake menu, “but we won’t be doing identical items. It will be a twist on what’s going on out here. We’re striving for upscale-casual,” James Mowbray says. As for who’ll be orchestrating and cooking that food? Paul Kalberer, the executive chef with whom the Mowbrays have long teamed in Avon Lake and, before that, at Morton’s in Tower City, will remain head of their suburban kitchen. The Mowbrays are currently interviewing candidates for the downtown kitchen, and intend to name someone early in February.